I love this series, each book is a stand alone and easy to follow regardless of you’re read any of the others, but they all have an escapist read feel, a story that’s easy to follow, full of real people and predicaments. They remind me very much of Holly Martin’s style of writing – if you like her stories then you’ll most likely love these too! I can’t recall Seth, Fliss or Harriet from the other reads, but do remember Chase and Matilda getting together, and Eva from Urban Genie, and it was good to catch up with them. So twins Fliss and Harriet run a busy dog walking business in Manhattan. Fliss is still protecting Harriet, she did it in childhood where their awful bullying father picked on her for her stammer, and Fliss attracted his anger first to save her from it. She’s still doing it, its become second nature for her, she loves her sister and would do anything for her. The business caters to their individual skills with Harriet doing what she does best, seeing to the animals – they don’t judge, and Fliss doing everything else including dealing with owners. Then Seth drops back into her life. Swoon…he’s gorgeous inside and out, a true gentleman. He married Fliss at 18 and all we know to start is that it was short lived. Fliss never talks about it, never talks about any problems come to that, just sorts them herself, locks things in her head. I really wanted to know why things went wrong, what happened and we get there in the end. Its been ten years now and having tried unsuccessfully to forget her Seth is back to win her over. she’s It for him, and he’s not standing back this time without some genuine reasons, not accepting her silence. Fliss, she’s so composed and confident but when she knows Seth is in Manhattan she’s a wreck. She wants to get it over, talk to him, so she can get back in her comfortable rut, carry on her organised and neatly boxed life. 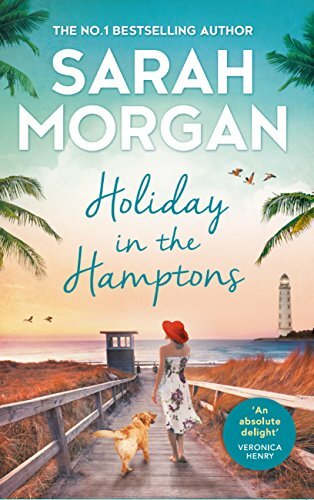 She can’t seem to take that first step though, then a phone call from Gran, needing Harriet’s help after a fall sees Fliss impersonating her, escaping for a few weeks to the Hamptons, hoping Seth will be gone when she’s back. It was a spur of the moment thing pretending to be Harriet, and she’s intentions of coming clean quickly, but then she bumps into Seth, he left Manhattan where he was covering for a colleague and is back where he lives and works as a vet, and the lie carries on…. Its a great read, lots of humour, lots of small town life and gossip, and through it all I was rooting for Seth, willing him to see what Fliss really meant, what she just couldn’t bring herself to say or do. I understood her actions but if Seth couldn’t get her to open up the two were doomed to love each other from afar. There’s drama here, lots of misunderstandings, lots of soft humour and teasing and its a great summer escape. Stars: five, a great summer read, perfect to relax with.